For the better part of the last 20 years, this noble elephant named Kabu had been forced to slave away in chains - but now she's finally free. And just as her body bears the scars of decades of mistreatment, her eyes are now shimmering with signs of hope. Kabu's story is an all too common one for working elephants in the forests of Southeast Asia, who are exposed to unimaginable suffering and abuse. Despite a past injury that left one of her front limbs painfully misshapen, she was continually kept in shackles and made to haul heavy logs up and down the mountainside for years on end. Thankfully, that sad era in this elephant's life has come to a close. This week Lek Chailert, founder of the Elephant Nature Park sanctuary in Thailand, traveled to secure Kabu's release into retirement. It was likely there that a caring person first saw the full extent of the elephant's crippling injury and heard her tragic story. Not only had Kabu been made to endure physical torment, she was made to suffer mentally as well. 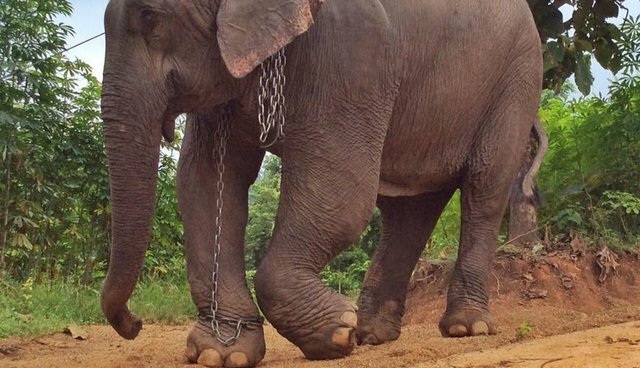 During her time in the field where she worked, the elephant had given birth to two offspring - one of whom was sold to a tourist camp, and the other who died by accident during a brutal "training crush" at the hands of her captors. Still, through the heartbreak, she persisted long enough to be saved. Chailert and other volunteers had prepared a truck with which to transport Kabu to the elephant sanctuary - an exhausting 12-hour journey that would mark the start of the elephant's new life of freedom. "It took almost half a day to walk Kabu to the truck. It was not easy for her to step on the transport as she was scared and confused," Chailert wrote on Facebook. "She must wonder what will happen to her next. Now she in the truck to our home. From today no more fear no more pain no more chain or work." Through it all, her rescuers were there to offer their comfort and support. The sun had set by the time the truck finally pulled into the safe grounds of Elephant Nature Park, a haven for rescued pachyderms, many of whom share stories similar to Kabu's. She seemed excited as she made her way down the ramp, welcomed by the trumpeting of the sanctuary's other elephants, perhaps the first time she'd ever seen creatures just like her unshackled. With an eager, outstretched trunk, Kabu greeted her new herd members. The most touching scene of all was the quiet relief so visible in her eyes and the tears streaking down her face - tears she wept out of joy, perhaps, sensing the life of peace that awaits her. "She rests now, chain free, on a deep bed of fresh sand," writes Chailert. To learn how you can help animals like Kabu at Elephant Nature Park, visit the sanctuary's website here.